Health and Beauty. Title will goes here. Easy to use - just lift it off the base like a kettle. 1 x Breville Hot Cup with Variable Dispense. Large water opening makes filling easy. Hot Drinks in 1 minute or less at the press of a button. Boils water in 1 minute. One Cup Kettle. ONE CUP CAPACITY - The compact water tank holds and boils a single cup of water in 30 seconds. Colour Black. SIMPLICITY - With its easy to use design, making a quick cuppa could not be simpler. 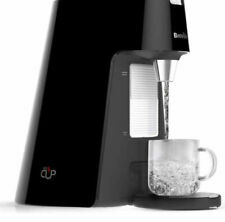 ---Dispenses one cup of boiling water at the touch of a button, so you only boil what you need ---One-touch operation with hinged lid for easy filling: perfect for those that cannot lift a heavy kettle ---Manual stop option for full control ---Removable, adjustable drip tray means no worktop mess ---Large front water window makes accurate filling easy Quickly enjoy any size hot drink at the press of a button with the Breville HotCup Hot Water Dispenser. Boiling water in less than a minute, it delivers tea, instant coffee, cocoa and more without the wait or waste. The large tank holds up to 8 cups making it great for both a personal pick-me-up or sizable brews. Light indicates when kettle is switched on. Double action filter for clear water and a cleaner kettle. The pilot light indicates when the kettle is switched on. Hinged locking lid: easy to use, maximum safety. The Textures Black Kettle combines a high gloss and matt finish. Boils one cup in just 45 seconds . Boil dry protection - automatically switches off when the kettle is empty. The 360 base complete with cord storage, maximises your kitchen surface space, and is comfortable for both left and right handed users. Boil dry protection - automatically switches off when the kettle is empty. The Textures White Kettle combines a high gloss and matt finish. Boils one cup in just 45 seconds . Boil dry protection - automatically switches off when the kettle is empty. Makes an 8-cup carafe in about 6 minutes with the powerful and precise 1500-watt heater maintaining an optimal brewing temperature between 195°-205°F. Carafe lid, filter basket, and showerhead are dishwasher safe and use BPA-free plastic. 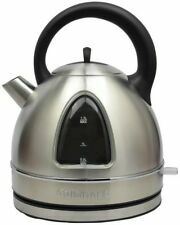 Wicklow - Plastic Kettle, 3000W, 1.7L, Easy Lid & Spout Filling, One Cup Boil, WHITE/Grey. Double action filter for clear water and a cleaner kettle. 1.7 litre capacity with a one-cup water indicator that allows you to boil only the water you need. The efficient way to boil water! Includes FREE 1L filling jug! Featuring one button operation, the VonShef Instant Hot Water Dispenser will be just as easy to use as your old kettle. 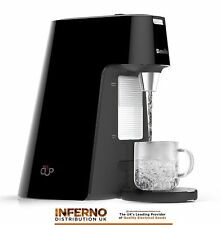 The instant hot water dispenser will begin dispensing hot water within 5 to 8 seconds into a cup or mug below its spout. 2600W Instant Hot Water Boiler Dispenser Tea Coffee Urn Kettle The instant water boiler allows you to prepare and enjoy a hot drink in a matter of seconds. The boiler has a carry handle and rocker lid for easy filling and turns on with the flick of a switch. VYTRONIX CUP01 3000W Fast Boil One Cup Kettle 300ml Instant Hot Water Dispenser Boiler. The Vytronix CUP01 is a fast boil hot water dispenser which gives you boiling water within a matter of seconds at the touch of a button. The Vytronix CUP01 is a fast boil hot water dispenser which gives you boiling water within a matter of seconds at the touch of a button. 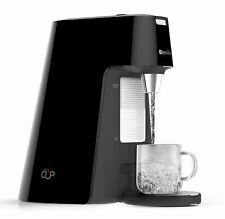 Morphy Richards Accents ONE CUP kettle HOT WATER DISPENSER Grade C WITH ISSUES!! Morphy Richards Accents ONE CUP kettle HOT WATER DISPENSER Grade C For Parts Non Functional / Faulty. Model: Accents. Notes: heats up but has various usage signs. power status light does not work. 5 out of 5 stars - Morphy Richards Accents ONE CUP kettle HOT WATER DISPENSER Grade C WITH ISSUES!! 2 product ratings2 product ratings - Morphy Richards Accents ONE CUP kettle HOT WATER DISPENSER Grade C WITH ISSUES!! Bella IKAT 5-Cup Electric Kettle. With the Bella Electric Kettle, go from countertop to tabletop with style and ease. This kettle includes a cordless base that rotates 360 for easy maneuvering. The one-touch operation makes for easy filling, boiling, and serving. The Cuisinart DK-17 Cordless Stainless Steel Electric Kettle is made of classic stainless steel with a graceful stay-cool handle. Features a conveniently located extra-large window with water marks that shows weather water is boiling or the kettle needs refilling. The Vytronix CUP01 is a fast boil hot water dispenser which gives you boiling water within a matter of seconds at the touch of a button. 300ml one cup capacity. Boil a cup of hot water in 30 seconds. This attractive brushed steel kettle has a 1.7 l capaciity and powered at 3000 W. The cord can be wrapped around the base, so that the kettle is easy to place in your kitchen. Multi safety system against boil-dry, with auto switch-off when ready or when lifted from the base.